Fewer commuters are getting to work by car these days, especially in densely populated cities like San Francisco. But riding the bus or a bike isn't for everybody, and for those commuters that want the conveniences of a car without the hefty fuel fees, there's the canoe-inspired hybrid electric tricycle. 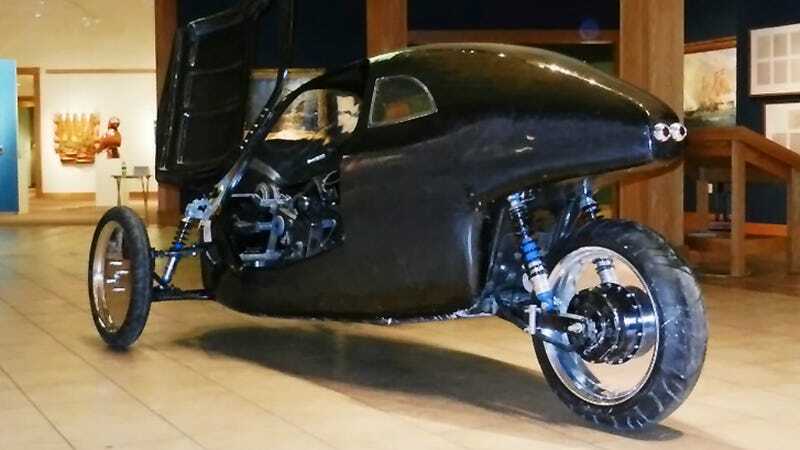 Dubbed the Human Electric Vehicle by its creator, Minnesota-based designer Lyon Smith, this unusual tricycle relies on a mix of battery-storage, regenerative braking, solar power, and the user's leg strength to travel between 75 and 100 miles per charge. With a fuselage composed of Kevlar and Graphite—the same materials used in a nearby Winonah Canoes production facility—the HEV weighs just 700 pounds. And while the driver does pedal, it isn't to propel the vehicle directly. Instead, the pedal power is used to drive a small electricity-generating dynamo that produces 20 percent of the charge needed to fill the vehicle's 10 li-ion batteries (and boost the range from 75 to the full 100 miles). The rest of the power comes from a wall outlet and the trickle-charge solar panels.